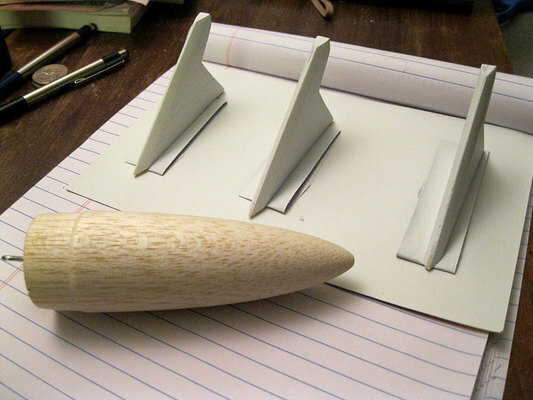 And some history of the "ARO"
Mike's nose cone factory is open for business! 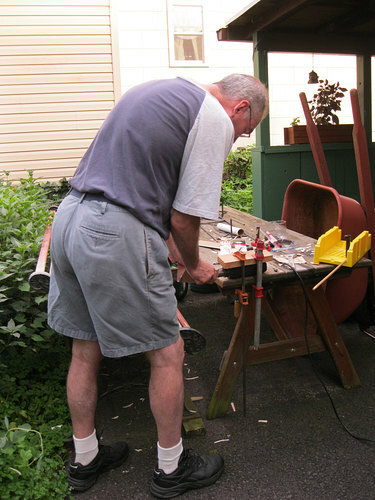 Under the block of clamped wood is an electric drill. 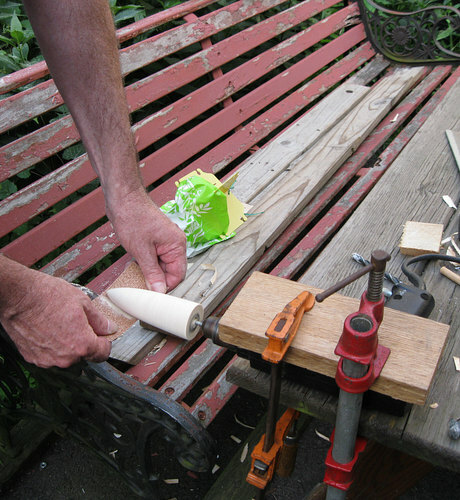 It should only take about ten minutes to make a nose cone, but the wooden peg came out of the balsa block. I tried to glue it back in with "hot glue" but that was a waste of time and it came apart. I then tried 5 minute epoxy but it didn't hold. Finally I used a 2.5" deck screw, which worked way better than the wooden peg and seemed a lot stronger. 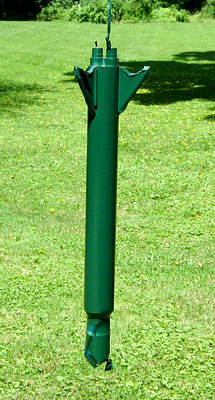 The wooden peg set me back over an hour, but it was OK; I cut the grass in the meantime. It's not an exact duplicate and the shank looks bad. 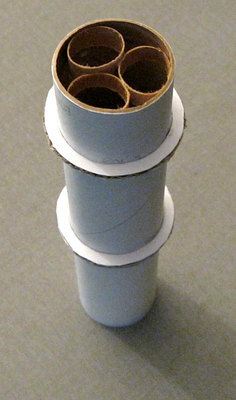 The paper towel tube, viewed from the bottom. Put all the parts together and it looks like a rocket! for the green paint. I like the silver and blue but I want to keep it looking like the original. print will have to be sanded out and then it needs to be repainted. These fins had a mirror finish till the masking tape pulled it off. 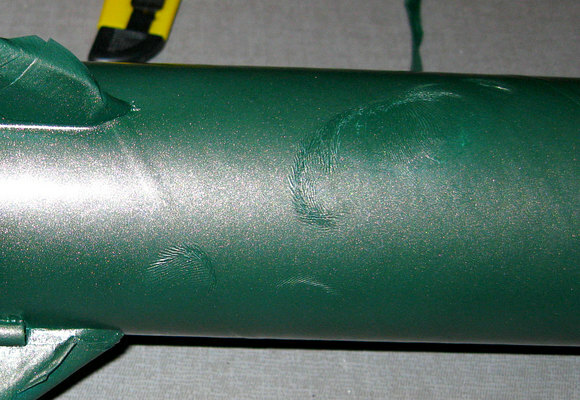 The tape also ruined the finish on the engine holders, which is why they are now green. After some touch-up, the Journeyman II lives! It weighs 8 oz. with engines, half the weight of the original. Time for "The string test!" The string test is the poor man's wind tunnel. 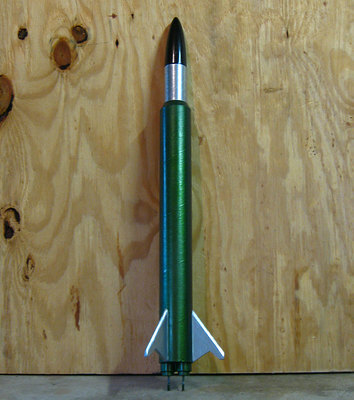 The object is to get some air flowing past the fins fast enough to determine if the rocket is stable. 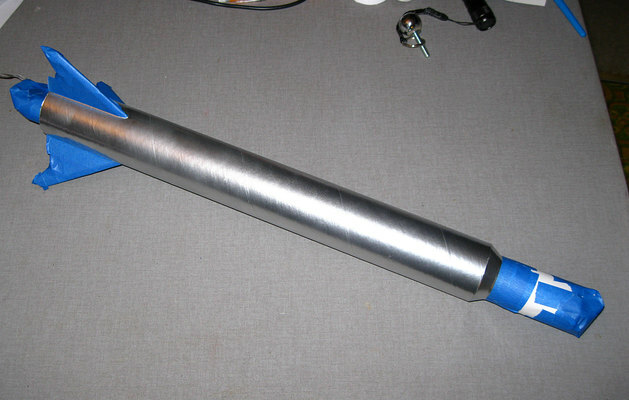 The rocket is balanced to find its center of gravity, then a string is tied at that point. 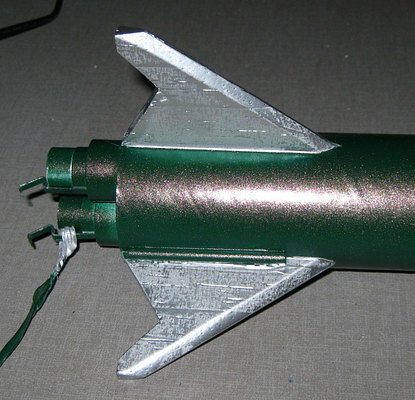 You then swing the rocket around your head while letting the string out. 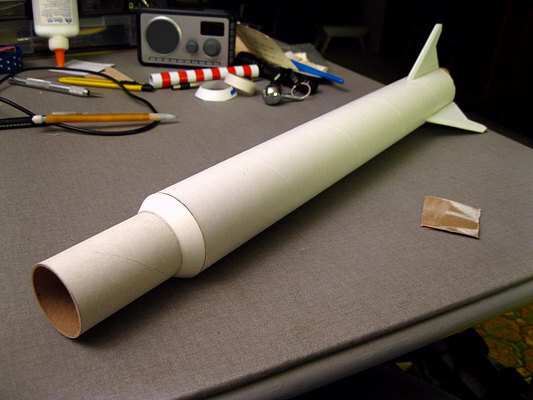 If the rocket is stable it will fly nosecone forward. If it isn't stable it will do everything but. The fix for that is to add weight to the nosecone. Perhaps the only picture in existence of someone performing a string test. Initially the rocket flew sideways. 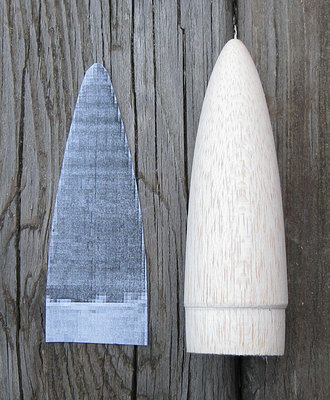 My girlfriend Andrea found two metal washers to add to the nosecone, then it flew straight.